This 15-volume miniseries features the most celebrated culture of the Colorado Plateau Province, the so-named Ancestral Puebloans. Because this comprehensive anthology is divided into specific subtopics, there are overlapping details in some of the volumes. Written in the guise of an encyclopedia, the reader determines which topics to read or ignore. The authenticity of this historical work is based on reliable interpretative research correlating to a standard endorsed by the National Park Service. Written for adults, the titles of the volumes are as follows: An Encapsulated Primer; a Georitual Landscape; the Utility of Pottery; Rock Art Intro to Archaeoastronomy; Chaco Canyon Archaeoastronomy; Archeological Benchmarks; Cannibalism in the Southwest; the Great Drought and Diaspora; the Puebloans; Hopi People; Zuñi People; a Time Machine Excursion; and the Colorado Plateau. The mystique and mystery centered on the Ancestral Puebloan culture as the only tribal people to have settled in parts of the Colorado Plateau Province for over a thousand years denote a prehistoric account. However, any account of their culture and presence is subject to conjecture and refutation because there is no written record. There is also the fact cultural scientists (archeologists and anthropologists) do not know the true name of their culture, other than today’s appellation, the Ancestral Puebloans. Before this designation, these people were popularly known as the Anasazi, which is a Navajo designation popularized by the likes of Richard Wetherill and Alfred Kidder). By any name, this culture is arguably North America’s most prestigious prehistoric people consisting of numerous tribal bands assimilated into a larger community over thousands of years. Although an outmoded designation since the 1990s, the lyrical-sounding A-na-saaa-zi designation remains popular in some circles while the designation, Ancestral Puebloans is now preferred by most Puebloans, as well as cultural scientists with one exception––the Hopis who occupy the so-named Hopi Mesa country relatively near Winslow, Arizona. Using the axis point of Cortez, Colorado, this so-named Four Corners region is thought to be the starting point for the Anasazi who arrived in this area sometime before the start of the Common Era, then later built settlements such as Mesa Verde, Hovenweep, and Chaco Canyon. Augmenting their hunter-gathering tradition, they became stewards of the land, earning the singular designation, dryland farmers. Accordingly, they are the first nomadic people to be accredited with establishing permanent dwellings and settlements in this vast territory due west of the Colorado Rocky Mountains. While the Ancestral Puebloan namesake is common in most circles, the Hopi People refer to their predecessors by a different name, the Hisatsinom, meaning “The Ancient Ones.” Moreover, they remained on the Colorado Plateau after the Great Drought (see below) while all other Anasazi communities relocated in parts of New Mexico. Again to mention the point, it is not known what the Anasazis called their collective tribal name, cultural scientists believe this amassed collective of numerous nomadic tribal bands first arrived in present-day Phoenix and Tucson sometime around the 8th Millennium. In time, individual communities of prehistoric people departed the desert and basin terrain, each distinctive band migrating north to a territory that would one day be known as the previously mentioned Colorado Plateau Province. Once there, these hunter-gatherer tribal bands continued their cultural traditions, temporarily occupying sectors of the higher elevation territory for some 14,000 years. However, none of these collective bands remained on a year-round basis. Eventually, one tribal people decided to return and stayed––the Anasazi. This sector of the Southwest, therefore, became their adopted homeland. Consequently, individual communities spread out in all directions and constructed permanent dwellings and settlements as opposed to living in temporary shelters (i.e., wikiups or living in caves). These primal agriculturalists also maintained a hunter-gatherer lifestyle, but also supplemented their diet with crops. This new way of living was possible because the Anasazi previously had bartered seeds from far southern latitude farming communities. Then soon after their return to the familiarity of the Plateau, the new stewards of the land planted a stable crop of flint corn and a small variety of squash. In time, a third crop, tepary beans, was also bartered, then planted. Because of the prevailing semi-arid climate, the previously mentioned “dryland farmer” epithet was applied by cultural scientists. Given this pioneering change of lifestyle (from nomads to dryland farmers), and, again to the mention the salient point, the Anasazi are the only known culture that sustained their existence in an expansive territory of varying elevations over many centuries. In time, most of the Anasazi communities abandoned their settlements and relocated to a more promising region where natural resources were not depleted. Fundamentally, the presumed and primary reason the Anasazi migrated some few hundred miles to the south and southeast was chiefly due to an epic and persistent drought that set in sometime during the late 13th-century. Consequently, all the natural resources that had sustained the Anasazi culture were no longer available, starting with the elixir of the Southwest––water. As will be mentioned throughout the remainder of the text, this prehistoric to the historical phase of the Anasazi continues a timeworn oral tradition, yet there is no reliable documentation given two aspects of their culture: Who these people were before settling on the Colorado Plateau, and what transpired between the late 13th-century to the 16th-century? For the Anasazi, this benchmark indicates the time of redefining their culture, starting in the Rio Grande Valley around present-day Albuquerque. Dividing their large numbers into relatively smaller tribal communities (numbering today’s twenty-one sovereign Puebloan settlements), the Anasazi, once again, had changed their lifestyle. Notably, designing their dwellings and protective villages made from a new material––adobe (i.e., sun-dried bricks). Later, when the Spaniards arrived in the 16th-century (around 1540), they referred to the native settlements as “pueblos" and dubbed the native inhabitants people of the pueblos. Since that time, the prehistoric people who once inhabited the sectors of the Four Corners region became known as Puebloans. 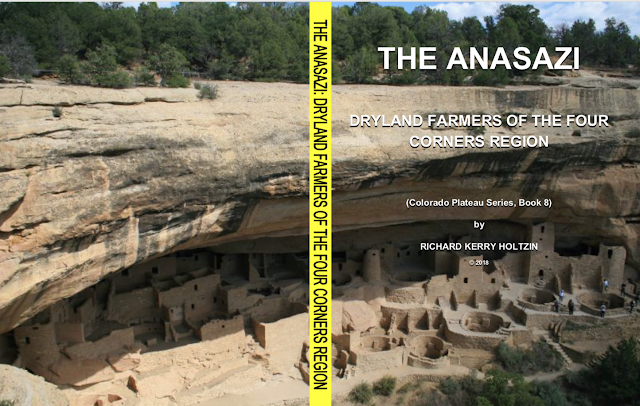 As for the title of this Colorado Plateau series volume, the Anasazi epithet is still fostered by the likes of the Anasazi Heritage Center (Cortez). Taking a page out of their book, I decided to maintain this original Navajo designation because of its ongoing appeal to the masses. However, what follows in this text is the commonly accepted Ancestral Puebloan designation, which, in part, also arises from a Spanish designation, “pueblo” (i.e., referring to a dwelling or settlement). For me, this historic to prehistoric designation makes little sense, since the Anasazi, by whatever name they called their culture and combined tribal bands, these industrious people occupied this sector of North America long before Europeans arrived. Still, I prefer using the atmospheric designation, Anasazi, just as some few other authors also prefer.